In the town where I grew up, there is a locally-owned steakhouse renowned for its Caesar salads. At this restaurant, Caesar salads are made in large table-side bowls, and copies of the recipe are available on cards for patrons. Over Christmas, I played sous-chef and helped my dad make this. My dad is a surgeon, and he would call for ingredients like he'd call for suction or a scalpel. It's pretty funny, but it resulted in a yummy salad. This salad is so good that I decided to make it for a recent dinner party! To mellow the garlic flavor, I added some sour cream to the dressing. 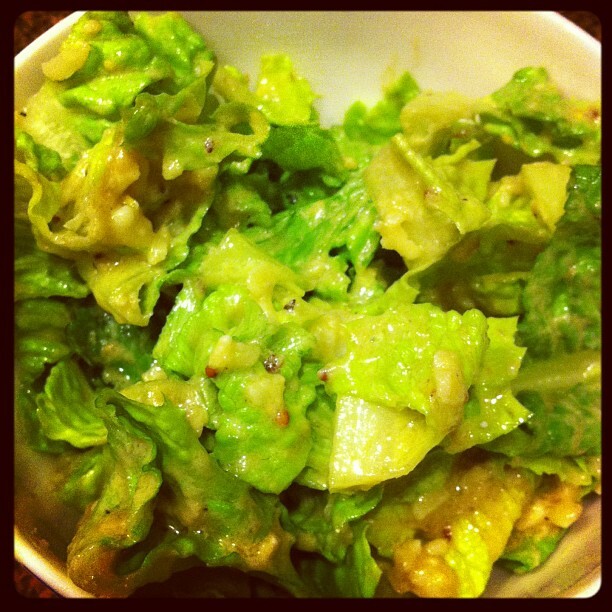 The recipe calls for you to wet all sides of the lettuce with dressing, but of course, use as much as you please. Enjoy! Place anchovies and minced garlic in a large salad bowl. Crush into a fine paste with two dinner forks. Add Dijon mustard and Worcestershire sauce to the paste and stir. Add the egg yolks, one at a time, and continue to stir. Slowly add olive oil while continuing to stir. Add the lemon juice, red wine vinegar, half of the cheese, and the sour cream. Stir to combine. If you are not ready to serve the salad, you can either cover the salad bowl and refrigerate, or remove the dressing and place it into a sealed container. To prepare the salad, place the Romaine lettuce into the dressing in the bowl (if you put the dressing in a separate container, add it back to the bowl), and toss. Make sure to wet all sides of the lettuce. Add the croutons and remaining cheese. Toss lightly, and serve on cold plates with chilled forks. Sprinkle with freshly ground pepper to taste. I really like a good caesar salad but I rarely order it. I have no idea why. This looks delicious!